Crisp allows you to chose the force the display language of your chatbox. 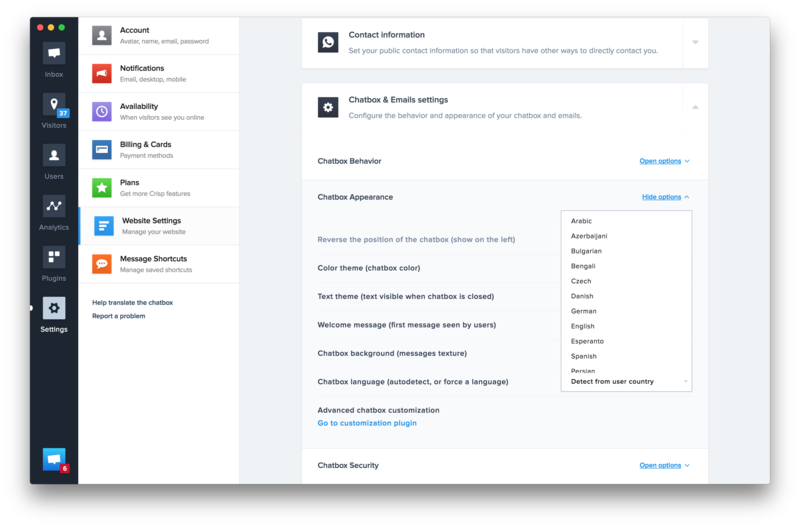 By default, Crisp automatically detects the visitor&apos;s browser language and serves the best language according to what the user&apos;s browser says it supports, and what Crisp supports. However, visitors tend to send messages in the same language as the chatbox. This means if a Russian user accesses your English website, and sees the Crisp chatbox in Russian, he&apos;s very likely to send his first message in Russian, until you reply to tell him you don&apos;t speak Russian but English. This is where you would want to force the chatbox language to English. Select your message in "Chatbox Language"